While Rick Owens’ SS19 menswear show went up in coloured smoke, the designer literally set his womenswear presentation on fire. Here’s everything you need to know. As always, the show took place at the Palais de Tokyo – this time, back out in the courtyard again. At the centre of the pavilion, the fountain had been drained and a structure which looked like a pared-back version of Tatlin’s Tower had been erected, which the models encircled as they made their laps of the runway. During the show, the tower was suddenly engulfed by flames, lending a ritualistic, pagan feel to proceedings. Where two seasons ago guests were given waterproof branded ponchos to protect them from the rain, this time around on each seat was a goodie bag. What was inside? Mini bottles of Mezcal, an visor, and what we can only conclude was a spanking paddle. All in all, a pretty great gift tbh. The designer invited Russian Witch House revivalists Ic3peak to provide the soundtrack this season, after the group protested against his unauthorised use of one of their songs at the SS19 menswear show in June. If you click the link above, make sure the volume is turned up loud. This season, the whole collection was designed for of a coven of witches, who, according to the show’s notes, live in the mountains casting hexes and spells, while searching for order and reason. 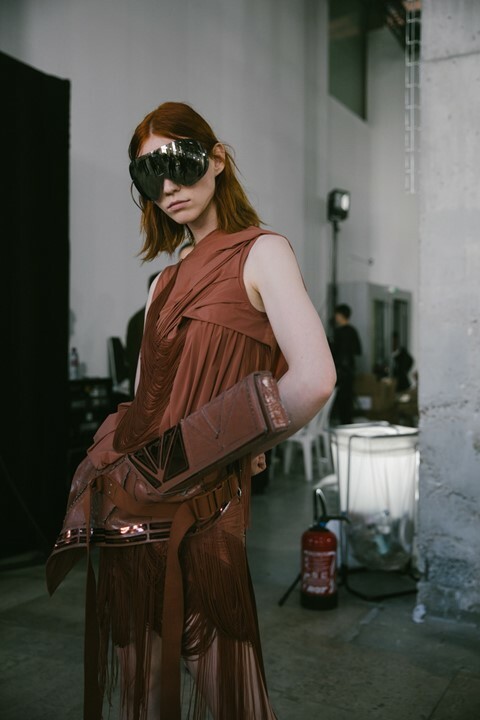 Long capes and slashed, floor-sweeping dresses were cut so as to become caged structures that encased the models’ bodies, while short, panelled tunics made of lacquered denim and rubber felt utilitarian, as if they were made with a post-apocalyptic landscape in mind. There was also a series of silk cloaks and robes, which billowed out behind the models as they walked. Many of the looks that made up the SS19 Babel collection were finished with geometric sculptures, with models wearing architectural, irregular cuboids on their wrists and on top of their heads like crowns. Others carried burning staffs, which added to the visceral, ceremonial vibe of the show. Also on the line-up were heavy hiking boots, designed once again in collaboration with Birkenstock, and huge, goggle-like sunglasses. The trend for tiny shades is all but over, according to Rick.